September was Challenge Day month for Grades 4 and 5! On Friday, September 14, Grade 4 conducted the off-site portion of their Challenge Day at Shaw Nature Reserve, where they experienced living history with activities that celebrated true craftsmanship. Specific activities included candle making and cordage making using native Rattlesnake master (Eryngium yuccifolium). Woodworking activities included cutting cedar shake shingles, splitting wood using a froe and maul, and drilling wood using an auger drill bit. 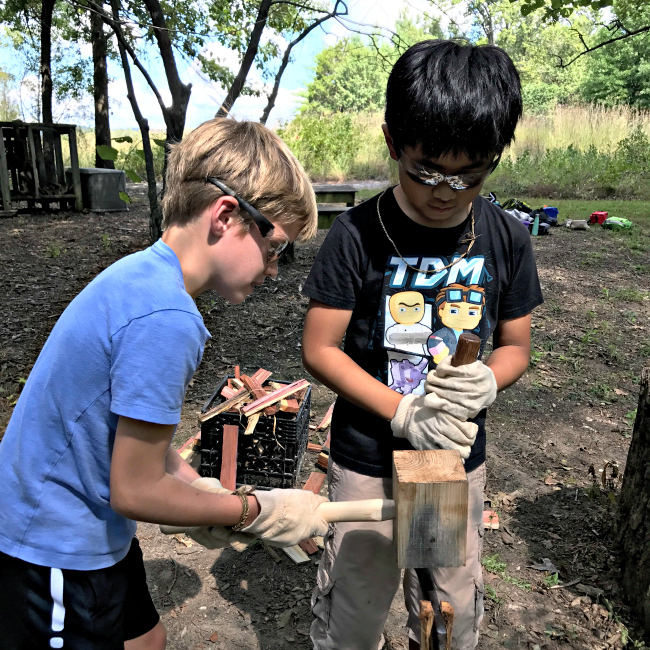 Finally, the students learned and practiced a variety of fire building techniques, including flint and steel and friction, and branded their own "wood cookie" mementos. On Thursday, September 20, Grade 5 experienced their Challenge Day on-site at Forsyth. Activities focused on teamwork and problem-solving. 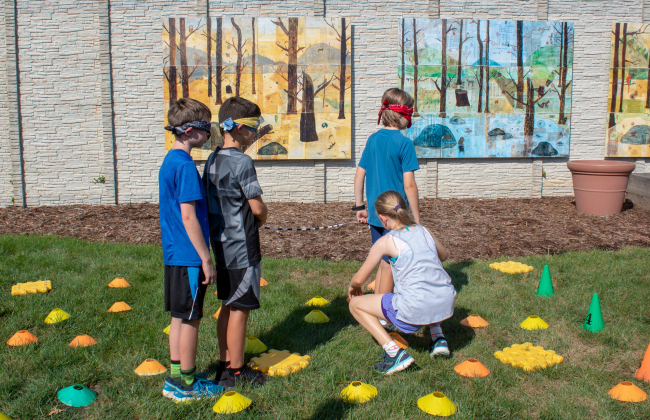 Outside, the students practiced their verbal communication skills as they navigated their blindfolded team through the "minefield" on the lawn. Inside the classroom, they worked as a team to build tall spaghetti structures. And in the Adventure Center, the kids rose to the challenge—literally—on the ropes course and through crate stacking. Some practiced bouldering (horizontal climbing) along the rock wall using hula hoops as extra obstacles. Most importantly, the kids trusted and depended on each other for spotting, building, and belaying. Upper School Division Director Darel Shelton said, "Challenge Days are all about stretching boundaries, working together, and daring to try new things. Block stacking is a great example...the students physically supported their peers by belaying them safely off the ground, while another team helped stack the blocks strategically so that each student could rise as high as possible. It was a total team effort, but the physical and emotional support allowed many kids to reach higher than they even thought possible."